In reviewing reports of air combat from Spain, China and the early stages of the war in Europe, the US Army Air Corps called for heavier armor and armament for its bomber fleet, including the addition of a tail turret. 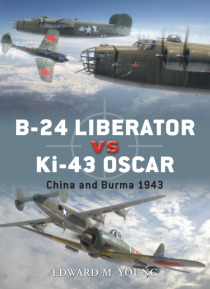 While Japan tried to counter with their own heavy fighters, their inability to produce them in any number meant that they were forced to face the bomber threat with the nimble, but … under armed Ki-43 Oscar . While severely outgunned, the Japanese learned to use their greater maneuverability to exploit the small weakness in bomber defenses. This book tells the story of the clash in the skies over the Pacific, as the Japanese fought desperately against the coming tide of the American bomber offensive.